Shown here is the rough pencil sketch which was slightly modified for the final pictorial representation, a line etching. 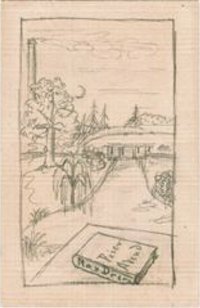 The preliminary sketch was drawn on a postcard which shows Max Drerup’s home address at that time: Beckum, Friedrichshorst, Westphalia. 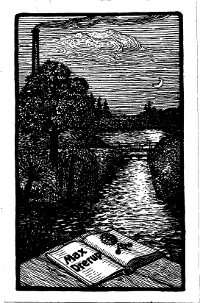 The bookplate radiates his love for his rural roots as well as the pastoral calm and loveliness of the countryside at the end of the day: a small river whose water is rippled by a gentle breeze, a smoking chimney, a willow on the bank of the stream, an open book with the name of its owner as well as gear wheel and compass which indicate the owner’s profession (engineer). Dainty clouds and a slim sickle moon over the peaceful countryside „paint“ a picture of blissful peace. 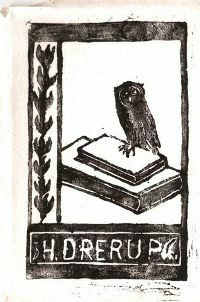 Karl’s relative, the archaeologist Heinrich Drerup, also made bookplates for himself such as the linocut seen here. He was the son of the renowned classicist Engelbert Drerup whereas Heinrich Drerup had studied art history at Freiburg, Munich and Vienna before choosing classical archeology as his main subject. Linking books and bookplates seemed only natural to a bibliophile like him. On August 26th, 2010, Karl would have turned 106 years old. Karl Drerup, the Westphalian universal genius, wanderer between two worlds: accomplished printmaker and illustrator, painter, ceramist artist and American Master of Enamels. The former pupil of Hans Pape and Hans Meid is one of the most versatile artists of his time, is one of the most brilliant 20th century masters of enamels in America. Yet he was not an ex libris artist. What a pity. 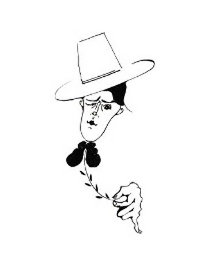 The self-portrait proves that he was a fine caricaturist in the modern style. 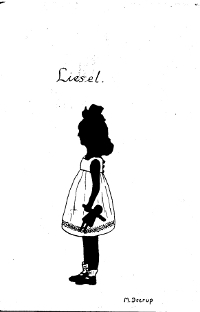 He shared his love of art with his cousin Elisabeth (Lisbeth) Steffens. They definitely were soul mates. 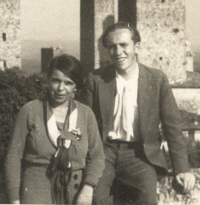 During the early 1920s the wayward and highly talented young woman studied at the Werkschule Köln and became one of the master class students of the legendary Professor Richard Riemerschmid. 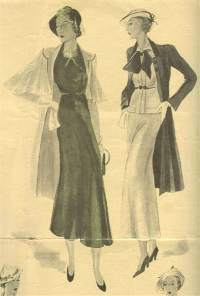 For many years, she used to be head of the Women’s Fashion Department at the Handwerkerschule ('Craftsmen College') Braunschweig. Christian Böringer: “Karl Drerup gave my great-aunt Lisbeth a wealth of his early works including numerous photographs that show the two of them in Germany and Italy during the 1920s.“ Böringer’s mother Marlene, a great-niece of Karl Drerup’s mother, finds it remarkable that her mother Therese and Lisbeth managed to rescue all of Karl’s drawings and paintings despite air raids including times of evacuation. Lisbeth lived with his oeuvre right up to the day she died in Mainz - October 2nd, 1980. Her paintings echoed in some way his style of painting and his preference for certain colors. Art seems to run like a red thread through the family of Karl Drerup, both on the maternal and paternal side of his family. The current issue of „Graphische Kunst“ - 1/2010 – („Karl Drerup – münsterländischer Wanderer zwischen den Welten“, Eva Masthoff) tells you more about Drerup’s graphic oeuvre which is being shown fort he first time at the Karl Drerup Gallery at Plymouth State University, New Hampshire. It was opened on August 14th, 2010.